It was Ladies Night at Grand Country's late night show, Branson Country USA. 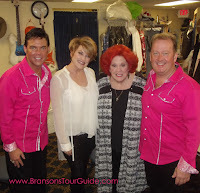 Guest stars Penny Cardin (Mickey Gilley Show) and LuLu Roman (TVs Hee Haw) nearly brought the house down. Their immense talent was on display for all to see and hear. Each touched the audience in their own way. Penny with a special song from the point of view of a person with Alzheimer's disease and Lulu with her comedy and love of Christ. Of course cast members, Melody Hart and Jackie Brown wowed the audience with their beautiful voices as they always do. Michael W. Davis got into the act giving new life to a classic Ray Price tune. This happened after Host Mike Patrick joked that Michael's mother had been calling to inquire why her son had not been featured on the show recently. He was in a word, fantastic! Backstage, the stories, hugs and laughs were as abundant as ever. It was a special night and a real treat to be there. Visit www.GrandCountry.com for more information.